Kathy Griffin has gone too far this time. The Irish American stand-up comedienne and Anderson Cooper sidekick has announced her new year resolution is to attack Willow Palin,daughter of Sarah because she is overweight. The kid is just 16-years-old. "I've already gone for Sarah, Todd and Bristol obviously. But I think it's Willow's year to go down. In 2011, I want to offend a new Palin," Fox News quoted her as having said. Targeting a minor, especially on such an issue as weight loss is frankly, disgusting -- and should not belong in any comedian's repetoire. Griffin should know better. She already got booed by US troops for attacking Willow during a live performance. Hollywood publicist Angie Meyer has it right. "To attack a young girl solely because of her last name seems rather contradictory of the types of justice she champions for others," Meyer said. "A 50-year-old woman who chooses to attack a 16-year-old girl publicly at a time when cyber-bullying and teenage suicide are at their highest reported rates, not only sets irreconcilable example for others, it's tasteless, immoral, and frankly - classless," she stated. "She's called people a fa---t on Facebook a couple of times. You don't throw around the f-word without hearing from me about it," she added. 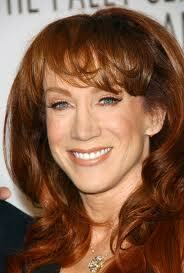 C'mon Kathy, you're 50, she's sixteen.